I have updated my MacBook Pro (15-inch, 2017) with macOS Mojave and everything is woking as per the need. But I think new feature of macOS Mojave called Stacks is not working properly on my MacBook when I set Group Stacks By to Kind. It just create one group with name Other and puts everything (Image, Doc, ZIP, Video) in that one group. I tried changing Group Stacks and restarting my mac but no luck. Is there any other setting for this which I am missing? I had the same issue and found that my Finder Preferences file was corrupted. The Solution for me was to Delete the com.apple.finder.plist File and then reboot. I actually just moved the file to the desktop temporarily until I made sure that a new one was created properly....and then deleted it. Note: You will have to reset all your Finder Preferences after reboot. Step #1: Open the “Spotlight”. Next, open Preferences and then find and delete the com.apple.finder.plist File. I have same issue when I change System Preference->Spotlight setting. From Monitor App, I found Spotlight progress takes a lot of memory, so I disable some options from Spotlight setting's *Search Results*, and then Desktop Stacks with those types disappear. 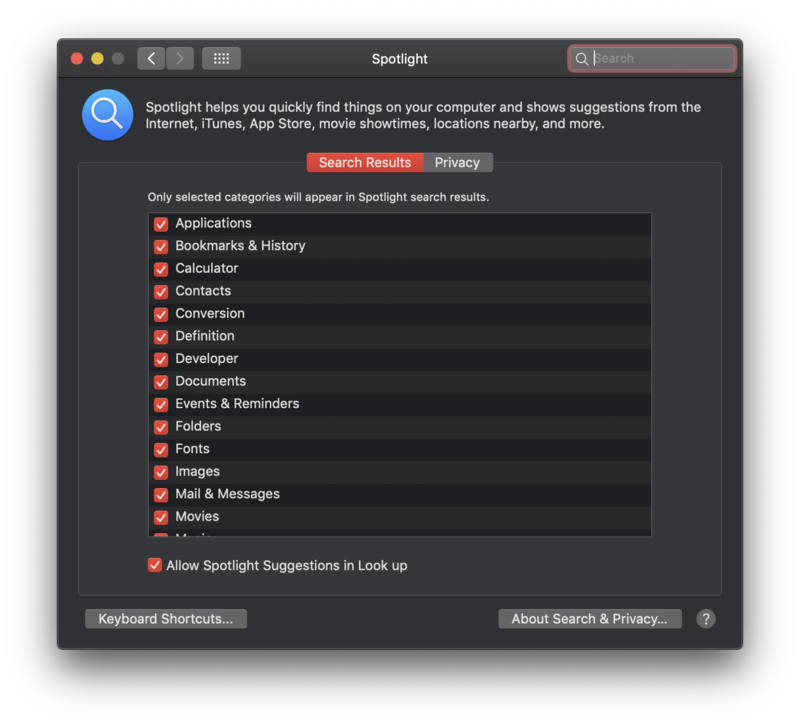 So, re-enable the expected type in Spotlight setting, the type will show on Desktop. I've had this problem since the Mojave beta and it just resolved itself. What I did was go into Spotlight Search Results preferences and make sure all the boxes are checked, especially the ones named for filetypes (e.g. Images, PDF Documents, etc). I had unchecked a lot of the boxes to prevent cluttering of Spotlight results since I mostly use Alfred to find files, but I think this prevented Finder from cacheing the filetype(?) which it might need to organize files into stacks. I just turned all the Spotlight boxes on and my Desktop very quickly rearranged into the correct filetype-specific stacks, so try that and see if it works. I also had to relaunch Finder (option+right click on Finder icon in the dock > Relaunch), so make sure to do that as well if needed. Edit: This is the same as @ooops answer. I had to to a PRAM reset. Not the answer you're looking for? Browse other questions tagged macos desktop mojave . Why did all my menus go blank and views become illegible?